On Thursday, Paste was proud to host Bassel & the Supernaturals in our New York Studio, where the soulful septet treated us to four slinky tracks from their latest album, Elements. The performance marked the latest installment of our Bands Without Borders series, which showcases minority and at-risk musicians, both in celebration of the diversity that makes our country great, and in defiance of President Trump’s repeated attempts to prevent immigrants from entering the United States. The Supernaturals are fronted by Bassel Almadani, a first-generation Syrian-American who packs his neo-soul confections full of impassioned lyrics about love, loss and the vivid imagery of an ongoing Syrian civil war that has claimed hundreds of thousands of lives, with no end in sight. Almadani and his ensemble raised over $11,000 during the preorder campaign for Elements, with over $3,000 in donations for humanitarian aid in Syria. A portion of the proceeds went to the Karam Foundation, a Chicago-based nonprofit working to build a better future for Syria, from education programs for Syrian refugee youth, to aid distribution, to funding sustainable development projects for Syrians. Almadani spoke passionately of his own family’s migration from Syria, where the persistent threat of political violence, largely at the hands of president Bashar al-Assad and his autocratic regime, has brought not just death and destruction, but lingering fear and anger that have stretched over decades. On the surface, there is nothing sad about the music of the Supernaturals, who blend strands of supremely danceable American funk and R&B. But as a kid growing up in Chicago, Almadani could hear the hurt as well as the joy in the music emanating from the speakers all around him. After performing the Elements track “Lost,” Almadani explained that the song was inspired by the death of his cousin, who was shot and killed by a sniper while riding a bus in Syria, as well as the dispersion of his extended family. 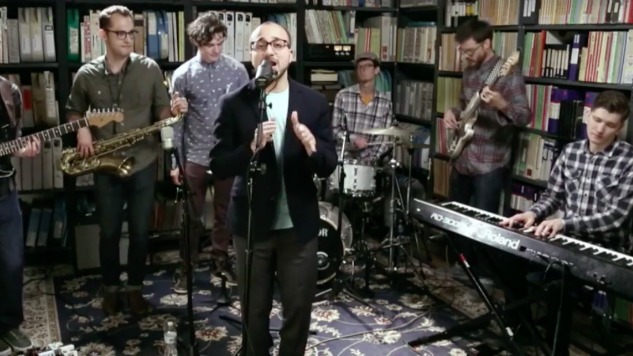 Watch Bassel & The Supernaturals’ full Paste Studio session above, as well the other entries in our Bands Without Borders series, and check out the nonprofit Karam Foundation here.